Set in southwest Florida, IN SUN DOWN FAR chronicles events that take place during an eleven day period in April 1990. The story concerns beach vendor Ellis Parkington's struggle to come to grips with his view of the complexities of human behavior. The music of the blues is interwoven throughout this tale of the ups and downs in friendships, relationships, and life on the tropical island of St. George Beach. 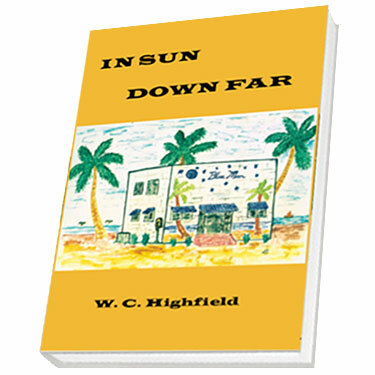 This is the debut novel of W.C. Highfield, who vacationed in Southwest Florida from 1991 through 2005, while residing in Wilmington, Delaware. In 2006, he moved to Fort Myers, Florida. He is a graduate of the University of Delaware and holds a diploma in Special Publishing from the Institute of Children's Literature in West Redding, Connecticut.